Hello! I'm gonna take a break from blogging about our next destination, to discuss about our biggest headache before we arrived in Japan. 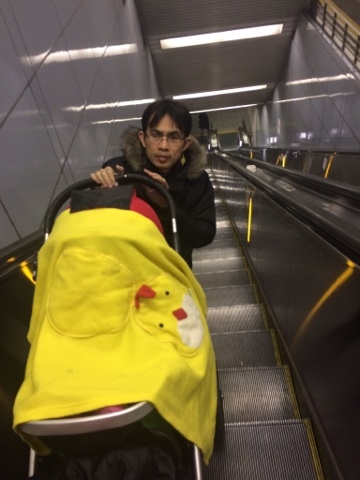 You see, we, like all parents to young kids, had Googled for advice and the advices (to our dismay) mostly suggested that it is not convenient to bring a stroller to Japan, unless it is the umbrella, lightweight type. Top reasons given in travel forums- Japan's subway stations mostly don't have elevators or escalators, the train is crowded, Japanese mothers carry their child in baby carrier so we should too, most places of interest required climbing some steps or just to put in plain words - not stroller-friendly. We know for a fact our kids and our own limits. There's no way we could enjoy our trip with our kids complaining and whining to be carried after half an hour walking, and besides, they are too big to be put in a baby carrier. Then there's the stroller problem. We happen to own a Babyjogger City Select - for those who are not aware of this brand, is a tandem stroller for up to 3 kids (which means it is not light at all). Sounds like we ought to forget about bringing our stroller to Japan, right? RIGHT??! So why did we decided at the last minute to bring the stroller??? 1. The kids tried (and failed) our walking endurance test (held every day for one week in KL as we went on shopping trips on foot in preparation of our Big Trip. After an hour, they started whining and asking to be carried / dragged their feet and refused to walk. 2. Checking in baby stroller on-board AA is not included in the baggage allowance (it's free of charge). 3. During the first 3 days in Japan, we are traveling by car, so the stroller can be stored in the car and used as and when necessary. 4. We'll be out and about the whole day so having a stroller will come handy during afternoon naps. 6. 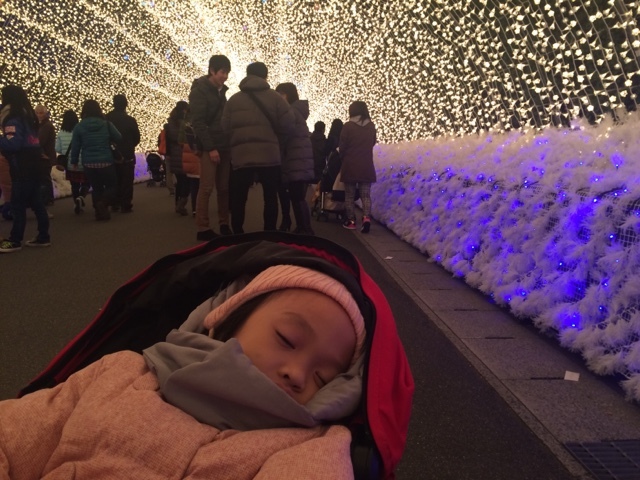 Our bucket list of must-go to places, with the exception of Ski Jam, are mostly stroller-friendly areas (museums, castles, Kaiyukan Aquarium, Universal Studios, Namba area). 6. Finally, between the 3 of us, we can carry the stroller up or down the stairs easily. Anyway, here is my review of whether it is worth it to bring a stroller to Osaka, based on my own experience. During our trip, we visited two museums - the 21st Century Museum of Contemporary Arts and the Dinasour Museum in Katsuyama. We noticed that there are lifts provided for parents with strollers / handicapped visitors. There are also baby strollers on loan (for free) if you wish to use a stroller. We learnt that many establishments like museums and shopping complexes provide baby stroller facility at no cost, so if you are planning to visit only these kinda places, then bringing a stroller is not necessary. We visited Kenrokuen Garden in Kanazawa, Nabana no Sato in Nagoya as well as the famous Saganonomiya (the Bamboo Groves) in Kyoto. We felt that we wouldn't be able to cover all of the garden if we had not bring a stroller! Japanese garden is really breathtaking and we managed to enjoy the strolls because we didn't get tired from carrying anything heavy. 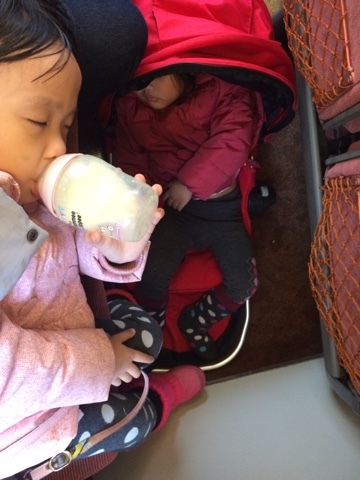 Every time the kids got tired or sleepy, they just popped into the stroller for a snooze. Especially my youngest one, Khadeeja, who has a very strict afternoon nap routine, during which time we were out and about. Also, since the some of the places we went to are in the open air, we brought along a waterproof blanket in case it should rain. 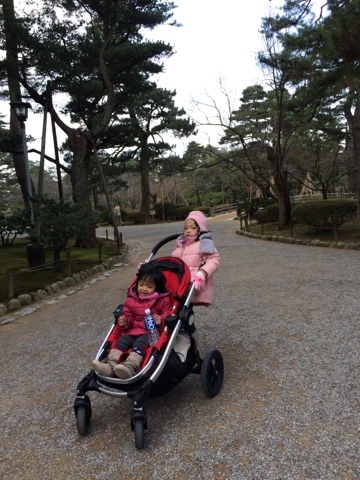 It so happened that during our trip to Saganonomiya, it started to rain and we continued walking with our kids soundly sleeping in their strollers with their blanket covering them from the rain. More traditional places tend to be located on higher grounds and not all areas within the compound is accessible by strollers. We didn't enter Kanazawa Castle nor Osaka Castle, so I can't really review whether the castles are stroller-friendly buildings, but to get to both castles required us to walk uphill, so pushing a stroller was a challenge. Some places only have stairs (e.g. Kinkakuji temple) so we had to dismantle the stroller and reassemble it after reaching the top of the stairs. Between the 3 of us, two persons needed to carry the seats and the frame (usually Le Hubby had to carry the frame coz it's quite heavy!) while my sister helped to hold my kids' hands and made sure they were not lost in the throngs of tourists! 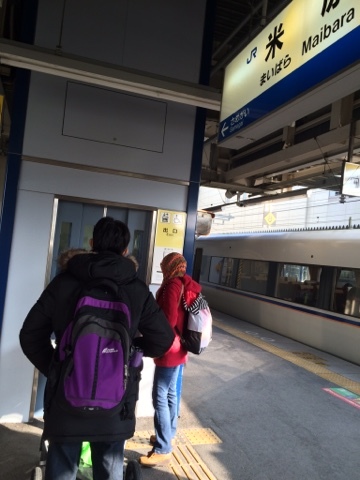 We used public transport in Kyoto and Osaka as our means of commuting between tourist sites. And what do ya know! Most stations do have elevators! (Except for a few JR stations that we took). The elevators are rather tiny but we can squeeze in our stroller easy-peasy! Just make sure your kids don't ride on the stroller whilst this is being done! Inside the train carriages, there is a dedicated area for wheelchair / stroller, but please avoid taking the train during peak hours (between 7-10am or between 5-9pm) because it's less likely to get a space to board the train with a stroller. Other than that, it's fine to travel by subways / trains. 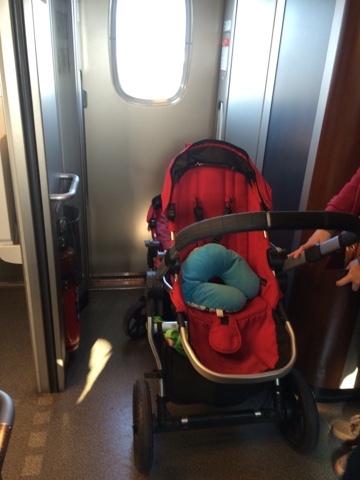 However when we took the inter-city train, we had to dismantle our stroller and stored it behind the last seats in the carriage or else it will be blocking the way. We also took taxis to some places and yes, taxis are stroller-friendly too! LOL! This may not be true for all restaurants since we only dined out several times in Osaka - at Kansai Airport, at a halal eatery in Osaka and an Indian restaurant nearby Kaiyukan. It's true though that at some places there's no space for strollers, but there are also restaurants that allow us to bring in our stroller. But, fret not. Even though we had to leave our stroller outside, we didn't worry about it being stolen. A little cold, perhaps, but otherwise, safe. Japan is after all, a relatively safe country with low crime rate. On top of that, our stroller also served a few other purposes during this trip. I can't tell you enough how much we appreciated our stroller throughout our trip. 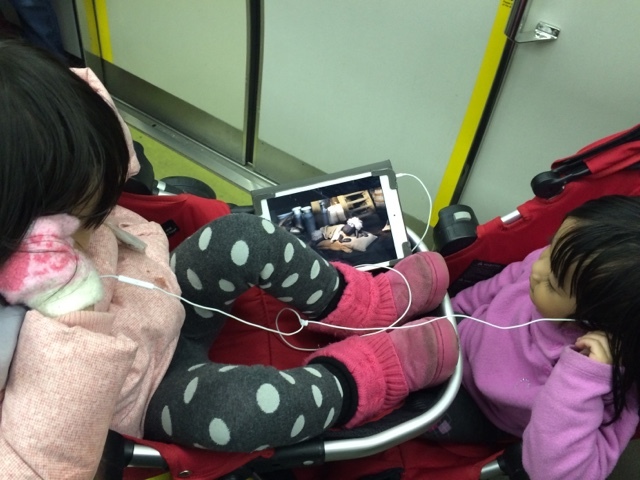 We also used the stroller seat as extra car seat in Fukui, since there's only one car sear available. The girls preferred this modified carseat because the shades can be pulled down to completely cover them from the glaring sunlight. Lastly, the stroller let us have extra privacy whenever we had to perform solat in public / open space area. Nobody really noticed us when the big, mighty stroller is parked in front of us! 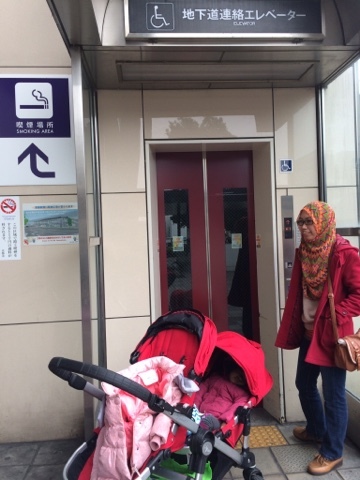 So, did we find it convenient to bring a stroller to Osaka? The answer is a big resounding YES! Kann...! Eh eh Kak Masy mcm experienced sgt bab nih ye? Hehe.